Size medium. Dated 3-45 (March 1945). Rare wartime dated example of this otherwise relatively common mask. The rubber facepiece retains good shape, is quite clean and in excellent pliable condition. There appears to be no cracking or crazing even when flexed. The pearl grey suede lining is complete and has less than average soiling. Fitted with a very good type 57 microphone assembly and a pink flecked dark tan coloured loom with the correct large 2-pin socket. The loom has a small frayed area on the sheathing but the cable is very sound. The harness is a little soiled but complete and retains elasticity. 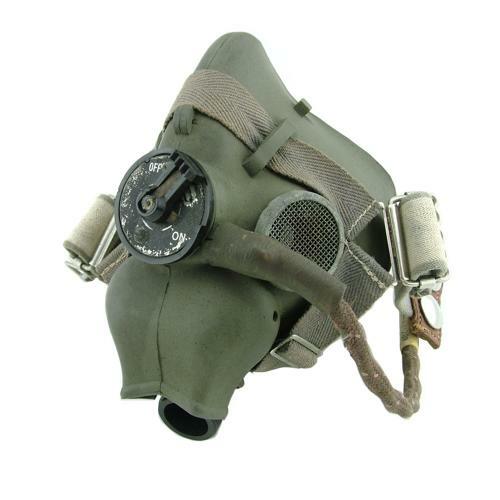 These late war H-masks are very difficult to obtain in any condition and are considerably rarer than the G-type mask. An excellent used example. Stock code O14716.